Don’t miss out on your reward! Start completing your wellness activities today. 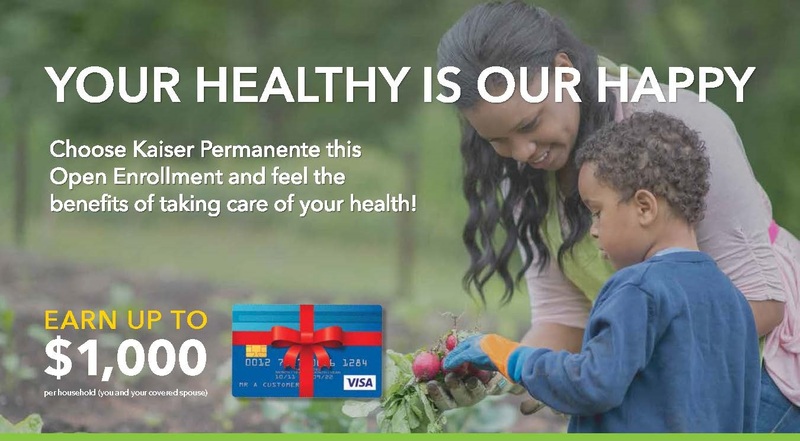 Each member and covered spouse who completes the Kaiser Permanente Wellness Program is eligible to receive a reward card — up to $1000 per household! Just complete four (4) simple wellness activities to earn your reward card. You can spend your reward money on anything you choose. Getting your reward is easy! Simply sign up for the Kaiser Permanente Wellness Program and accept your Wellness Program Agreement. Visit kp.org/engage to view and track the status of your activities. Please Note: The 2019 Wellness Program is effective 01/01/2019 – 11/30/2019. Answer questions about your daily habits and get a personalized overview of your health. The online questionnaire is secure, confidential, and only takes about 20 minutes. Visit kp.org/engage to get started. Complete a biometric screening at a Kaiser Permanente medical office or at an SHBP-sponsored screening event. ONLY screenings performed by a Kaiser Permanente clinician are eligible for the reward*. For a list of upcoming screening events and to schedule an appointment, visit kp.org/wellnessevent. New users enter the code SHBP. You must be current and comply with all recommended age and gender appropriate preventive screenings for breast, cervical, or colorectal cancer. Visit kp.org/prevention for a list of recommended health screenings for adults. Complete one online Healthy Lifestyle Program (HLP). Learn more about these programs here. *IMPORTANT: All screenings must be conducted by Kaiser Permanente in order to be credited towards earning your Wellness Program incentive. For biometric measurements and preventive cancer screenings that have been completed by a previous provider, you can submit a screen capture of the appropriate tests from your previous medical record, or physician visit in which those tests were performed, and email to product-operations@kp.org. You may also contact Workforce Health Member Support via phone to 866-300-9867. Click here for more information regarding the wellness program appeals process.